Mrs. Mary Myrtle Stewart Ransom, 90, of 205 Bells Lake Road, Washington Twp., NJ, formerly of Rowland NC, was born on October 4, 1927 and departed this life on Saturday, October 7, 2017. She is preceded in death by her husband: Mr. Marley Ransom and a son: Mr. James H. Ransom. The funeral will be 11:00 a.m. Saturday, October 14, 2017, at Pleasant Grove United Methodist Church with Rev. George Locklear officiating. Burial will follow in the Pleasant Grove Church Cemetery. Mrs. Ransom is survived by one sister: Ms. Celia Wilson; one brother: Mr. Sanford Stewart; three sons: Mr. Edward M. Ransom (Pamela), Mr. Richard M. Ransom (Clair) and Mr. Keith Ransom; one daughter: Ms. Paulette Dietrick; a devoted grandmother to five grandchildren: Jamie, Nicholas, James, Dillon and Julia; a cherished great grandmother to Canon and Gatlin; and a host of relatives and friends. 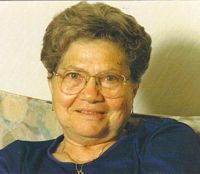 She was a faithful member of Pleasant Grove United Methodist Church. The family will receive friends from 10-11 a.m. Saturday, October 14, 2017, at Pleasant Grove Church.